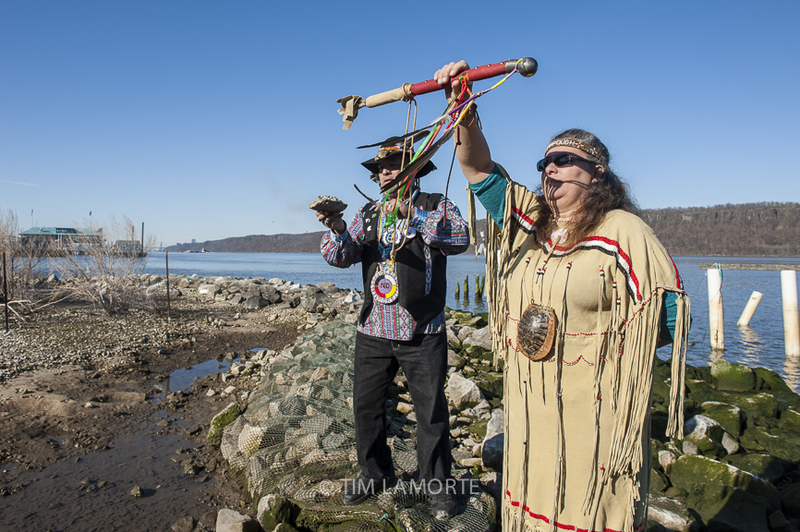 YONKERS, NY — Earth Day dawned with blessings and songs on Sunday, April 22, at the salt marsh behind the Sarah Lawrence Center for the Urban River (CURB). The 12th annual gathering was led by Bob Walters, the captain of Groundwork Hudson Valley’s Science Barge, a floating hydroponic farm anchored south of CURB. The program included two songs, “Oseh Shalom” and Shehecheyann,” performed by Gerald Cohen, the cantor at Shaarei Tikvah in Scarsdale, as well as two songs led by musician Taffy Williams, including “This Land Is Your Land” (click below to hear a recording). The blessings were delivered by Tony Moon Hawk Langhorn and Marcey Tree in the Wind, a Native American couple from New Jersey. He burned white sage while she held his war club aloft. Langhorn also placed a small statue of a Native American among the riprap. The statue had been on a shelf in his bedroom. “I figured he could do more good here than watching me sleep all night,” Langhorn said.